The Defense Ministry said the ships "undermined strategic mutual trust" and "damaged peace, security and good order in relevant waters." Chinese officials reacted angrily to the presence of two U.S. Navy warships in the South China Sea on Sunday, with a Defense Ministry spokesman calling it a "provocation" and "a serious infringement on China's sovereignty." In a statement, the ministry said the military immediately dispatched naval ships and aircraft to "warn them off." The confrontation occurred near the disputed Paracel Islands, which are claimed by China and its neighbors, amid escalating military tension between the United States and China and planning for an on again-off again summit over North Korea's nuclear arsenal. Experts believe China — North Korea's largest trading partner — was behind the recent derailment of the June 12 summit between President Donald Trump and the North's leader, Kim Jong Un. Citing Defense Ministry spokesman Wu Qian, the statement said the U.S. warships "undermined strategic mutual trust between the two militaries and damaged peace, security and good order in relevant waters." 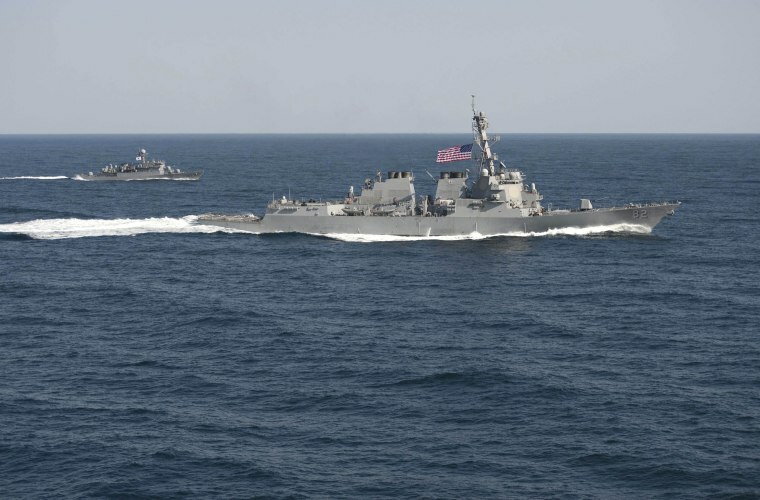 A U.S. defense official said the two warships — USS Antietam and USS Higgins — had been conducting a "freedom of navigation" operation near the Paracel Islands. In a statement, the U.S. Pacific Fleet said such operations "challenge excessive maritime claims and demonstrate our commitment to uphold the rights, freedoms, and uses of the sea and airspace guaranteed to all nations under international law." The statement added that sucgh routine and regular operations "are not about one country, nor are they about making political statements."